My first vacation since I live here in Singapore took place last 22nd to 26th of August in Thailand! It was a memorable moment with my friends Allan, Ann, Anthony, Chichi and Ivy together with her boyfriend Sonny and sister Irene, a total of 8 tourists! It was also a good thing that our former officemate Off was our official tour guide and sort of photographer and yes, he is good in photography. 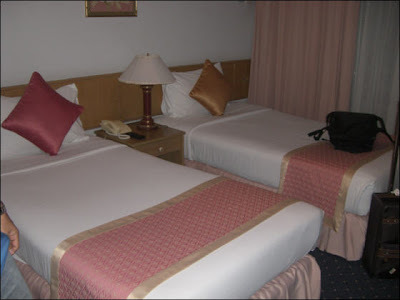 We all met in the airport and went directly to our hotel in Samran Place. The hotel was really nice, very neat and very accomodating guard. The most important thing was that the room was very comfortabel to sleep with. We were all amazed by the rooms and it was a good deal for a very cheap price hotel and take note, free breakfast was included. On our second day... mas mainit!!! Good thing we hired a van as our major means of transportation. Thanks again to Off. The driver was very nice and Off brought his Vietnamese officemate Zhang (yun nga ba yung name?) to make a tour in Ayutthaya! Mostly mga ruins na temples naman dito, yung mga luma na and sira sira. But still, the view and the sight was really great. We also watched an elephant show and they were really cute and nakakatuwa dahil sumasayaw sila... Hahaha... We had our lunch in this cool restaurant and Pad Thai was an instant favorite! Good thing there is a store here in Singapore that sells Pad Thai. Later that night, we had our dinner in Baiyoke. It was an ultimate buffet and we really enjoyed the foods! We also headed to the top spot of the building where they said that it was the highest peak in Bangkok. The view from the top was really nice! It was like a view in The Peak in Hong Kong and the only difference is yung umiikot kami habang nasa tuktok ng building. In our last day, what all we did was super shopping! Grabe ang tagal namin sa MBK and we bought many items and some pasalubongs and souvenirs. The experience in Thailand was really great! For sure me kasunod pang trips! More pictures here!